US Senate Democrats Urge Resolution Calling for Removal of EPA Chief - Integration Through Media ....! 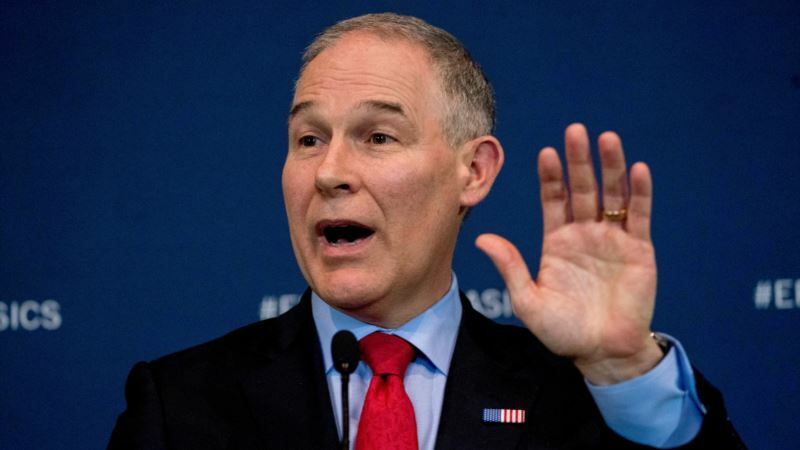 (VOA): Senate Democrats are formally calling for Environmental Protection Agency chief Scott Pruitt to resign or be fired, citing allegations of ethical lapses and questionable spending on travel and security. New Mexico Sen. Tom Udall said the mounting allegations against Pruitt mean “it is time for his imperial tenure to end.” Udall and other Democrats said they will introduce a formal resolution calling for Pruitt's ouster “for the good of the American people.” Congressional Republicans are standing by Pruitt, making it unlikely the measure will succeed in the Republican-controlled Senate. But Democrats say it's a sign of their frustration with Pruitt over his lavish spending on security, first-class airline tickets bought at taxpayer expense and his bargain-priced rental of a $50-a-night Capitol Hill condo tied to a lobbyist. Speaking at a Capitol news conference, Udall said Pruitt has “misused taxpayer dollars while enhancing his own personal perks,” skirted enforcement responsibilities to let polluters off the hook and “subverted scientific processes in a manner we have never seen.” President Donald Trump had defended Pruitt, downplaying the ethical questions swirling around his embattled EPA chief while commending his work at the agency. Advancing Trump’s agenda “Administrator Pruitt is focused on advancing President Trump's agenda of regulatory certainty and environmental stewardship,” EPA spokesman Jahan Wilcox said Wednesday. EPA Inspector General Arthur Elkins is conducting at least five investigative audits related to Pruitt, including a probe into questionable spending by his swollen security detail. The Associated Press first reported last week that the 20-member team tasked with providing day-and-night protection for Pruitt had racked up salary, overtime and travel expenses approaching $3 million. Pruitt's staff has said the outsized security spending and his first-class flights were justified because of “unprecedented” death threats against him. Senate Democrats sought to undercut that argument Tuesday, citing a recent internal EPA analysis that concluded “EPA Intelligence has not identified any specific, credible, direct threat to the EPA administrator.” The career staffer who wrote the February memo questioning Pruitt's security costs, Mario Caraballo, was fired Tuesday shortly after the existence of the memo became public. He was the latest of at least a half dozen EPA employees dismissed, demoted or placed on involuntary leave after pushing back against Pruitt's spending demands. Staff for the Republican-led House Oversight committee expanded its review this week of Pruitt's travel spending to include ethical questions surrounding his bargain condo rental. The property was co-owned by the wife of a prominent lobbyist who runs a firm with a roster of fossil fuels clients who have received favorable regulatory rulings from Pruitt's EPA. The Office of Government Ethics is also demanding documents related to Pruitt's condo rental. While they flinch at repeated revelations about his ethics and spending, congressional Republicans say Pruitt has led administration efforts to ease federal regulations on manufacturing, mining and other industries. Conservative groups also have weighed in on Pruitt's behalf.